The other day, I found a Japanese style pub named "れんこん屋", which means lotus root, at Kiyamachi Street while walking around there. 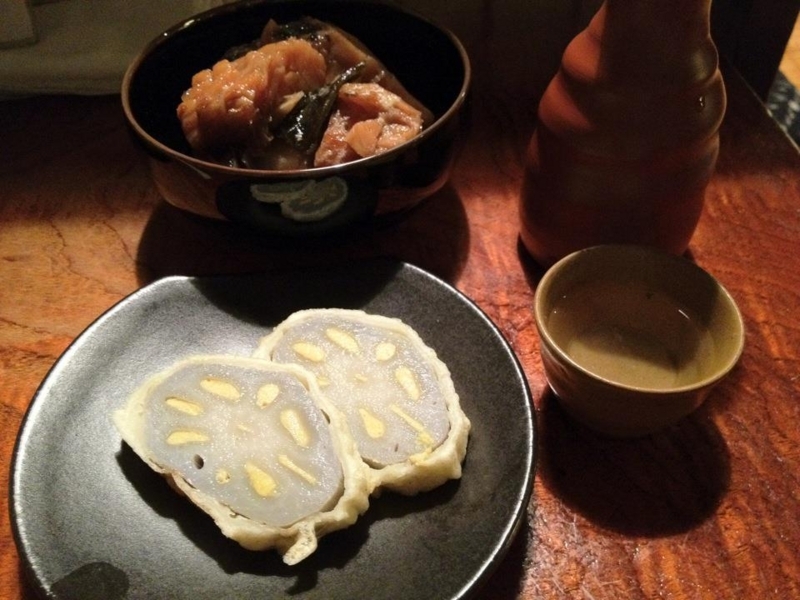 It seems to set up からしれんこん, sliced lotus roots which holes are filled with Japanese mustard. I love it so much that I visit the pub today. からしれんこん is one of specialty products in Kumamoto Pref. Whenever I eat those, I'm attacked by the pungent taste, sometime, with tears in my eyes but feel so delicious, especially with a bottle of hot sake. I heard a sort of interesting thing there. Some months ago, mass food intoxication by raw beef became big social problem. Ministry of Health & Welfare started restricting the supplying raw beef at eateries. からしれんこん became notorious at some time before because of the same incident. People in Kumamoto Pref decided that they must absolutely avoid that about horse sashimi, which is the most famous food in Kumamoto, and have been keeping clean reputation about that as a result of their efforts.